This is for yesterday’s Queen for the Day Challenge over at Splitcoast. We’re honoring queen Joan for her fabulous gallery, kind comments and dedication to the Technique Lover’s Challenge. My inspiration was this wonderful card from Joan’s gallery. What spoke to me was the beautiful bow and the three ornaments. My card base is a standard A2 and has been layered with a red cardstock followed by a piece of designer paper that’s been stamped and embossed in gold as well as sponged with the same red as the card stock. 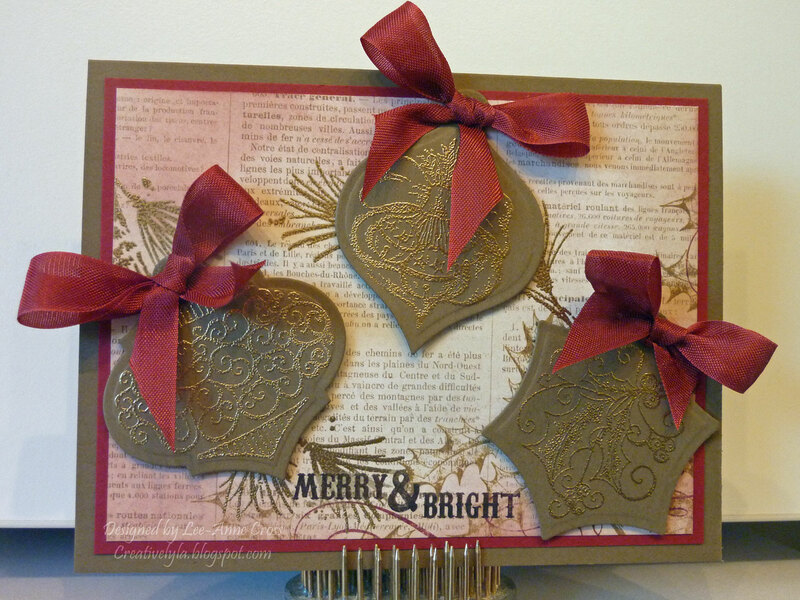 I cut this specific piece of designer paper to showcase the “Merry & Bright” sentiment. The ornaments are stamped and embossed in gold. Then they were cut out with the co-ordinating Spellbinder’s dies and popped up on dimensionals for added interest. I tied little bows in the same red color and attached them with Tombow Adhesive. Have a super Saturday, everyone! This is gorgeous, Lee-Anne! I love the gold embossed ornaments, so very elegant.